Let's talk about your best personal experiences with art. What were your prejudices about the work/artist? How were they resolved? What moved you the most about the viewing? How were you inspired/repulsed/provoked? What works of other artists come to mind, and how would you compare them? Because one's response to art is so very personal/subjective, I strongly believe there is no wrong way to perceive someone's work. All opinions are valid. Actual images rather than links would be preferable, thanks! I'll start. A big discussion about Leonardo Da Vinci brought something to mind the other day, so with apologies, I'll reprint it here in hopes of getting a different sort of ball rolling. 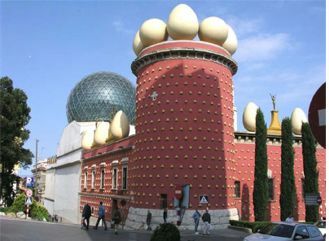 I will always cherish the memory of a trip to the Salvador Dali museum/home in Figueres, a town a couple of hours outside of Barcelona. Previously, I had not really thought much about him beyond that one painting of the dripping clocks that we all know, and the fact that he was a surrealist. I wasn't much of a fan either, btw. His paintings always felt a little creepy and empty and strange. His vision just seemed too personal to be able to relate to. The mustache, however, delighted me. When I got there, the first thing that struck me was that every inch of the place had been lovingly and meticulously designed, from a minaret or gable on a roof to the outlay of the stones on the path leading in. - to extremely subtle things. For instance, in one corner, if you move your head back & forth in front of two sculptures placed oddly in an alcove, they become cleverly animated and are "interacting." I loved his sense of humor - that if one is willing to look and move in strange ways and look like an idiot, he richly rewarded you with a "secret" about the piece that no one else was seeing. Dali was fascinated with mirrors and mathematic calculations, ways to bend perceptions, and he was greatly influenced by DaVinci. This was my very first "wholistic" experience in an art space. 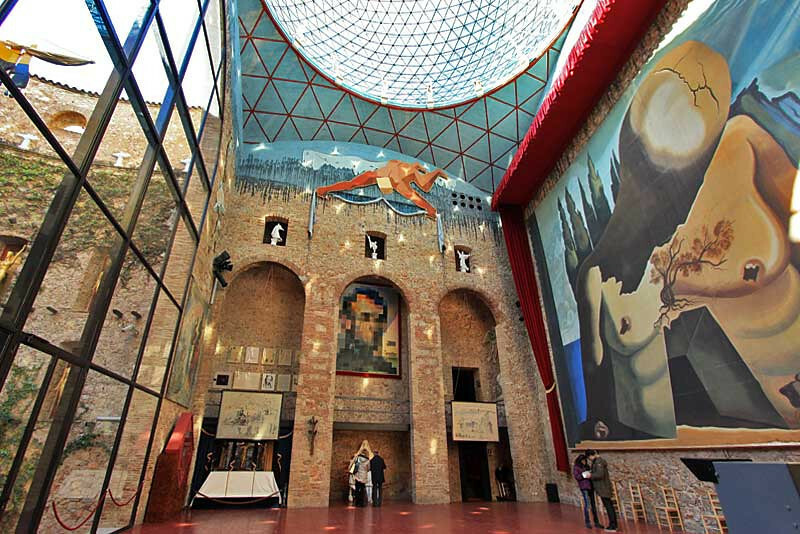 When you first walk in, there is this giant, incomprehensible mural that shows a massive figure (one of many "portraits" of his long-suffering wife and muse, Gala, here in androgynous form) in which a hole in the chest is gaping open. It's puzzling, even ugly, and seems to contain a lot of empty, inexplicable space when viewed in isolation. The light you see in the corner is coming from a huge bank of windows. and look across from this courtyard at the right time of day - the panes of the windows in front of the mural seem to disappear in the reflection of the sun, giving the mural a weird, shimmering - and very deliberate - effect. What's more, the entire courtyard becomes a dreamscape in which the sculpture of the "boat" suddenly is seen to be emerging/sailing from the crack in the skull of Gala's head, floating upon a shimmer of light. Look down from that perspective, and the car it's mounted on is emerging from the tomb-like opening in the chest. The effect was astonishing. I came across it quite by accident at the end of the day, and my heart started pumping furiously because my brain had never made those connections before. I wanted to grab the people just casually passing by the window and show them what I found, but I couldn't because of the language barrier. Here it was right in front of them - a whole other layer and way to view this entire museum, and they were trudging by in a tour bus stupor. The hours of calculations that had gone into achieving this effect completely overwhelmed me . To this day, I've never been quite able to fully describe the beauty of this amazing thing. I had entered the portal of another world. 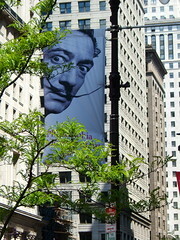 All the notes that Dali had written about his philosophy of art - how there are miracles in the ordinary just below the surface, how he tried his whole life to capture a way to make people see with spiritual eyes into other realms - began to make sense to me, and I realized suddenly how many vast universes I may not accessing when I looked at his work. Here was an artist to be trusted with my time and attention, because so much more than paint and raw materials had gone into his vision. And context was absolutely everything. Last edited by Brynn : 02-18-2014 at 09:51 PM. I like the whole idea of not accepting a work of art on face value, and at least trying to see what else might be going on. It would be cool to see what others see in a particular artist. Let's talk about your best personal experiences with art. What were your predjudices about the work/artist? How were they resolved? What moved you the most about the viewing? How were you inspired/repulsed/provoked? What works of other artists come to mind, and how would you compare them? Because one's response to art is so very personal/subjective, I strongly believe there is no "wrong" way to perceive someone's work.All opinions are valid, so I'd love the focus to be kept on the art rather than criticism of the perceiver, if possible. 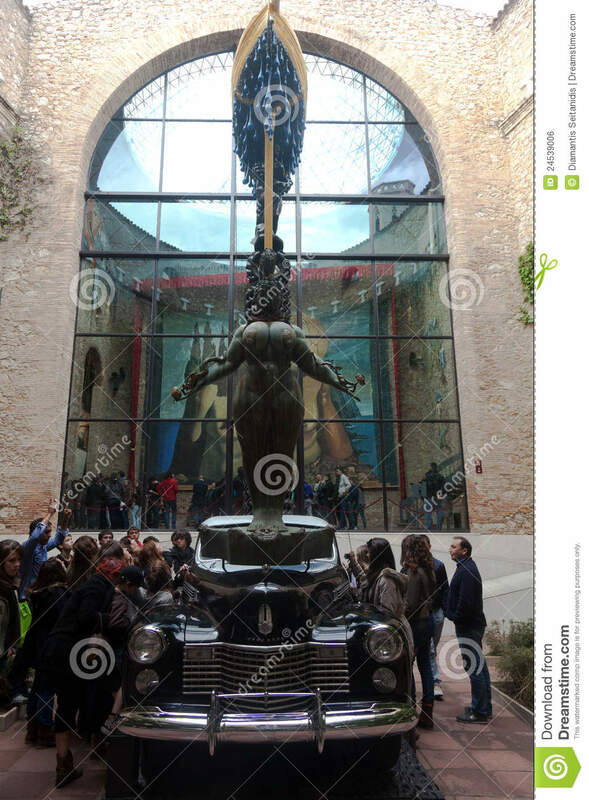 I will always cherish the memory of a trip to the Salvador Dali museum/home in Figueres, a town a couple of hours outside of Barcelona. Previously, I had not really thought much about him beyond that one painting of the dripping clocks that we all know, and the fact that he was a surrealist. I wasn't much of a fan either, btw. His paintings always felt a little creepy and empty and strange. His vision just seemed too personal to be able to relate to. The moustache, however, delighted me. Inside was even more so and I realized that from walls to ceiling, the entire complex (that he had designed himself) was one giant art installation, with a new perspective to be offered in every corner - from really obvious things like an arrangement of paintings and a couch became the face of Marilyn Monroe, to extremely subtle things like if you move your head back & forth in front of two sculptures placed oddly in an alcove, they become cleverly animated and are "interacting." I loved his sense of humor - that if one is willing to look and move in strange ways and look like an idiot, he richly rewarded you with a "secret" about the piece that no one else was seeing. 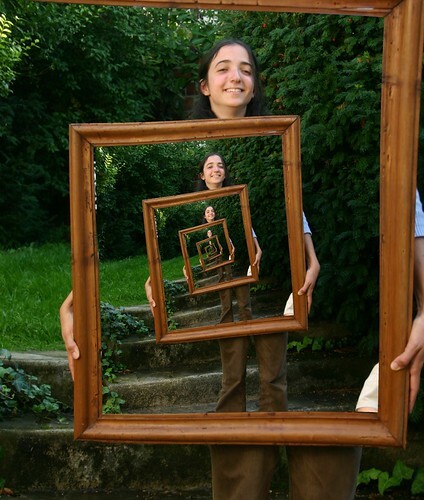 Like Da Vinci, Dali was fascinated with mirrors and mathmatic calculations and ways to bend the perceiver's mind, and he was greatly influenced by him. When you first walk in, there is this giant, incomprehensible mural that shows a massive figure (one of many "portraits" of his long-suffering wife and muse, Gala) in which a hole in the chest is gaping open. It's puzzling, and seems to contain a lot of empty, inexplicable but devoted space. At one pivotal moment during the day, if you go through the bank of windows, cross this courtyard opposite the mural ,passing this strange ship thing that's actually even up higher because it's mounted into a full-size car (full of grass? I think? )...and you go up four floors to a particular window and look across the courtyard at the right time of day - the panes of the windows in front of the mural seem to disappear in the reflection of the sun, giving the mural a weird shimmering - and very deliberate- effect. What's more, the entire courtyard becomes a dreamscape in which the sculpture of the "boat" suddenly is seen to be emerging/sailing from the crack in the skull of Gala's head, floating upon a shimmer of light. Look down, and the car it's mounted on is emerging from the tomb-like opening in the chest. The effect was astonishing. I came across it quite by accident at the end of the day, and my heart started pumping furiously. I wanted to grab the people just casually passing by the window and show them what I found, but I couldn't because of the language barrier. They were missing it. Here it was right in front of them - a whole other layer and way to view this entire museum, and they were trudging by in a tour bus stupor. The hours of calculations that had gone into achieving this completely overwhelmed me (easy to do for me - I'm not so good at math ) . To this day, I've never been quite able to fully describe the beauty of this amazing thing. 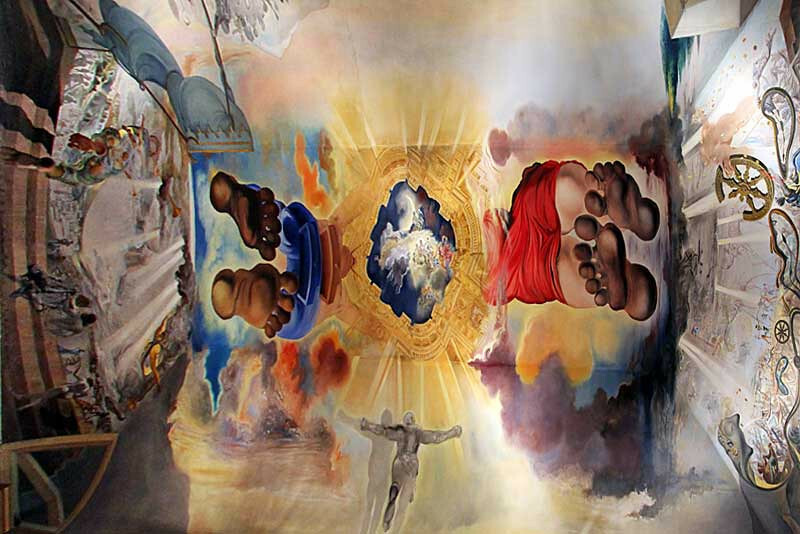 All the notes that Dali had written about his philosophy of art - how there are miracles in the ordinary just below the surface, how he tried his whole life to capture a way to make people see with spiritual eyes into other realms - began to make sense to me, and I realized suddenly how many vast universes I was not accessing when I looked at his work. Here was an artist to be trusted with my time and attention, because so much more than paint and raw materials had gone into his vision. And context was absolutely everything. I can't speak as eloquently as Brynn but here is one of my favourites by J W Waterhouse. Of course, I have a thing for poisoners and malevolence. I love how art always comes from other art - one movement gives birth to another. I started reading a little more about Waterhouse since you posted that, Snake. He painted around the turn of the last century and was loosely associated with the pre-Raphaelites, who were rebelling against the formalist structures imposed by an art world locked into the aesthetics of Raphael. I didn't realize that they were one of the first modern avant-garde movements in painting. I remember being absolutely entranced with Waterhouse paintings as a young girl. At the time, I think I mostly just responded to them because they were "really pretty" and they appealed to me as a window onto another time. It was very escapist for me. They are so lush and detailed even viewing them here on a computer, and I always imagined that I would be blown away by them if I ever saw any in person. At a time when women were barred from voting or owning property, these women don't take any guff. Here's what looks like a completion of the study above. 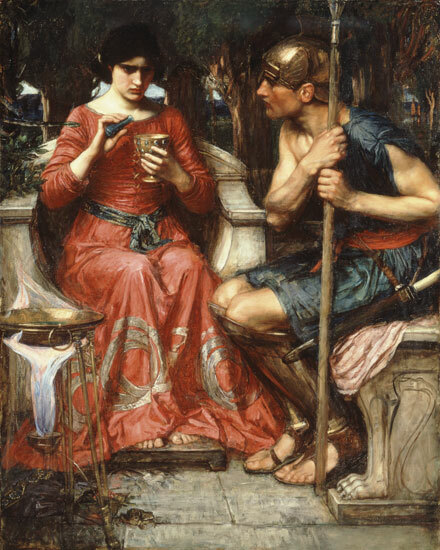 "Medea and Jason"
I'm struck by the intelligence and sensuality that Waterhouse captures in the faces of his women, along with an intense connection with the natural world. It's no wonder that the paintings are embraced almost iconically by alternative religions and practices like Wicca, astrology, tarot. 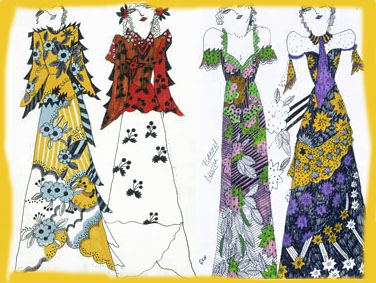 This whole art movement takes place during the Victorian period when typically I think of women as being repressed and prudish - and yet, in the art world, the Pre-Raphaelites were celebrating the wildest opposite, and getting away with it by couching everything in terms of myth in order to present women as powerful, influential and almost innocently elemental. Here's an amazing detail from Waterhouse's "Hylas and the Nymphs." I think some people might initially dismiss his paintings as being "too romantic" or "sentimental" and the title of this painting ("Gather Ye rosebuds While ye May") certainly begs that - and yet, just look at the intelligence in the eyes and depth of feeling in the face - he paints with such a sympathy and respect for the dignity his subject, and it reminds me of one of my favorite American portraitists, John Singer Sargent. I wonder if he and Waterhouse ever met? They must have influenced each other. 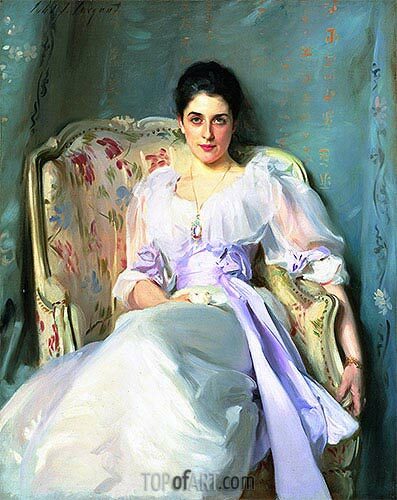 The overall impression I get of Sargent's women, however, (especially in Lady Agnew) is of a world in which women have been driven underground - buried in the tangles of society, or pushed to the fringes of society like the theatre. There's an anger smouldering here, that, (unlike Waterhouse - who actually empowers his subjects) seems to be tinged with a kind of quiet, cold acceptance. eta - this is probably really dumb, but I've always been fond of the way Singer paints her ears a rosy red, as if they are burning with the malicious gossip of others! Last edited by Brynn : 11-05-2006 at 01:56 PM. He paints as to make appendages appear raw, like knuckles and noses and stuff. Maybe the heat wasn't on in the studio! Ive noticed it on countless other paintings as well. Maybe my circulation isnt as good as those old timers. thank god. They are so lush and detailed even viewing them here on a computer, and I always imagined that I would be blown away by them if I ever saw any in person. That particular painting is here in Adelaide. The pic I posted was the best one I could find on the net but it doesn't quite capture the malevolence in her eyes. Irl, it's chilling. You're certainly right about the faces and eyes. There were several variations of this that spanned a few years - each new wrinkle lovingly recorded. 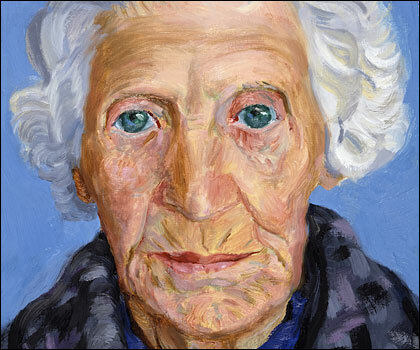 To actually stand in front of this painting in person was to see how her eyes glow with this really intense blue honesty and to feel as if I am Hockney himself that she is focusing on with such presence, kindness and fondness. Rendering her in paint wasn't dynamic enough for him though, and his work with polaroids show a kind of struggle to see everything animated in all the many-faceted angles that being present with someone entails. His portraits of pairs are wall-sized, and remarkable in that although they are double portraits, it's almost as if each subject is in their own separate painting, and Hockney has a distinct relationship to each. It was interesting to see how his comfort and familiarity with his subjects made all the difference. He seemed to approach others slightly outside his inner circle with an interesting degree of alienation. He's very exacting about how he poses his subjects and what they wear. He's more interested in pursuing his own perception of them and their relationship than perhaps what they would prefer would be shown. These two, if I remember correctly, were sometime-lovers (the one on the right travelled extensively). 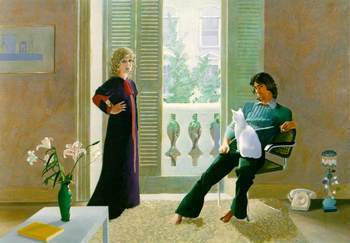 Hockney was picking up on something between them and deliberately posed them this way. Their marriage ended a year later. Last edited by Brynn : 02-18-2014 at 09:59 PM. 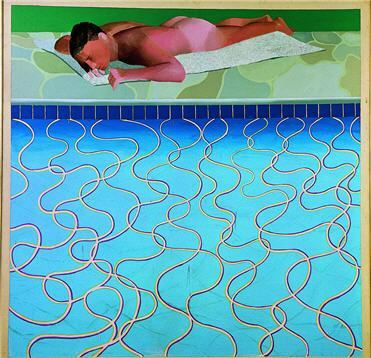 I'd love to hear anyone else's reactions to David Hockney's stuff, or any other art experiences that come to mind. M. C. Escher worked by hand but some of the transformations he used were entirely mathematical, and so the same can be applied by computer to digital images. I've always found Escher's work fascinating and I could look at it for hours, but the nagging question that always lurks in the back of my head is how much of it is simply clever and how much of it is art? or is that cleverness a form of art? For instance, I can't see much that would be interesting about "Print Gallery" without the visual twist. The first of those two Flickr photos above I would call "aesthetically pleasing", but the second I'd hesitate to do the same. Yet I do find it fascinating, but it doesn't seem the same kind of fascination I'd feel for a work of art that was beautiful without being clever. Wow HF, I just now saw this, and can't believe I missed it earlier - I must have gotten too busy over the holiday season or something. I was fortunate once to see some of his prints up close at the L.A. County museum, and was blown away by the detail, the sheer man hours that had to have gone into each piece - I realize that some artists are masters at creating art with a few quick gestures, like Picasso was in his later years, for instance. But there's something about looking at a piece that you know took someone hours and days and in some cases years even to complete - it seems to give a strange glimpse into the eternal time an artist willingly enters and obviously forgets himself in. And then, there it is right in front of you! A kind of tombstone erected to the time devoted to the creation of the work, a map or record of the artist's imaginative journey that's now sealed and never again to be entered - not by the casual observer, anyway. I think that's the magic Escher captured - the ability to draw the viewer in to marvel with a hint of the same fascination/obsession he must have felt drawing it. Brynn, thank you again for creating yet another source of inspiration here. Art that is shared, or shows how people relate to their existence empowers individuals. People in Frederic Remington's world are facinating, because they are close to us in time, at least our grandparents time, and in the US, but also as our democracy, or republic, or whatever we have, it includes horses. It is amazing to think how many years the horse was the only mode of transportation. Remington's talents as an illustrator and war correspondent transformed his later works. The National Gallery of Art in Washington, DC had a fabulous exhibition, "The Color of Night" in 2003 which was unforgetable. All his canvas was about the same size, large, so looking into the scenes gave one the feeling of being at a window into the past. 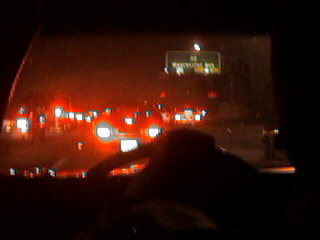 Just great. Strong, night colors, with intellectual and emotional power of people and animals of the wild west who laid the path for what we have now. Lovely to think we can go back for a visit. Wow xfox, what a moving site - thank you! You know, for years, I've seen some of these images in prints, but never really bothered to find out much about them or about Remington himself, even though going to high school in Lubbock, Texas meant that I was always seeing lovingly framed prints of his work in people's living rooms, and entire art galleries devoted to western art. I was mostly puzzled by its appeal, and thinking about it, I was probably so bitter about being uprooted from Maine as a teenager that Remington always represented to me everything that was hateful about living in Texas at all. I was pretty scornful, in fact, and didn't give it much attention. What's great about exhibitions like this one is that it's always an eye-opening, and even heart-opening experience. I loved reading about his early experiences with the Spanish-American War and how it changed his painting. There's such an immediacy and drama and a commitment to faithfully recording what he saw that must be amazing to experience close-up, full-sized. They are very much a window into a lost world. Its been hard for me to get past the iconic nature of his images, and going through this site reminds me that these scenes were real, and represent an artist's very deep emotional connection to his traumatic experiences. "You will find that what feels most personal to you is probably what's most universal to all, and that's why you have to be brave." Oh if I could find a painting like that, I would certainly buy it. Photos just don't cut it. about four sundays ago, it so happened that i found myself in grand old selfridges department store in london. i couldn't help but notice the big series of posters hanging from ceiling to floor down every escalator void, announcing that a major installation by brian eno - "77 million paintings" - was currently set up in their expansive, dark and plush basement space known as the ultralounge. would you believe it!? well, being very fond of brian's antics and capers in the realm of electronic bleeps, buzzes, video experimentations etc. over the years, i didn't hestiate to make my way down there to see what he's up to these days. i sat there luxuriating on one of the quirky-yet-comfy settees, watching and listening for quite a long while. i began to feel a wee bit hungry. after quite a lot of pondering i finally decided that to eat one of the 100% authentic german frankfurters i'd bought in the foodhall earlier would be a fitting response to mr. eno's latest work, one that he himself would probably look kindly upon, so that's what i did. i enjoyed it very much. Last edited by zero : 03-25-2007 at 07:48 PM. i tried to read brian eno's autobiography, and ended up with nothing but swollen appendices.